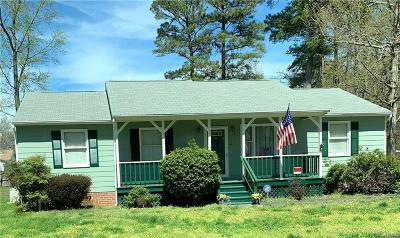 This Charming Rancher has 4 bedrooms and 2 baths located in a quiet country setting. This property features a Large Country Front Porch, enter into a delightful living room, and into a bright eat in kitchen with lots of cabinet space and to the side a laundry area. Off the Kitchen is a bedroom, down the Hallway are 2 bedrooms and a Hallway bath, and a Master bedroom with a walk in closet and full bath. Walk out of the kitchen to a graceful lounging deck. Nicely landscaped front and back yard with a shed (the shed being sold AS-IS). Conveniently located to the Mall, and Ft. Lee. AGENTS PLEASE SEE ADDITIONAL SHOWING INSTRUCTIONS UNDER AGENT ONLY COMMENTS. Directions: From The Boulevard, Turn Onto Lakeview Ave., Turn Left Onto Branders Bridge Rd., Turn Right Onto Temple And Left Onto Colonnade Dr.